Wireless headphones have been around for years but never quite took off with the audiophile crowd as the limitations of Bluetooth codecs and bandwidth left a lot of audio detail out. Thankfully, however, Bluetooth has advanced quite a bit over the past several years and now we have codecs like aptX HD and LDAC, offering hi-res wireless support that help headphones cut the cord without losing fidelity. 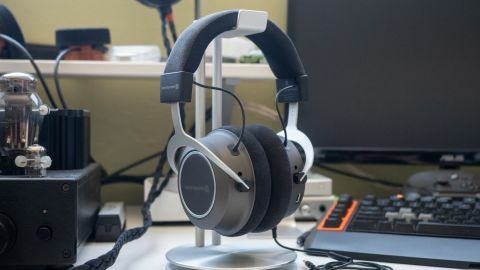 The result of all this progress in the wireless space is the new Beyerdynamic Amiron Wireless, the best-sounding wireless headphone we’ve ever heard. While there are some compromises - like its bulky design and average noise isolation that make it less than ideal for travel - if any headphone will convince the audiophile crowd to embrace wireless, it’ll be the Beyerdynamic Amiron Wireless. The Amiron Wireless features the iconic Beyer look ... which is to say the headphones are huge but extremely comfortable. Since the Amiron Wireless are so big and don’t fold up, they’re not ideal for traveling and, even if you wanted to take them with you, you’d need a backpack to lug these massive headphones around. That being said, it's not hard to find lighter, smaller travel headphones out there - many of which feature noise-cancellation tech that eliminates outside noise at the expense of sound quality. Build quality is excellent and the headphone feels like it will last for many years to come. The headphone is made of a mix of plastic and metal to keep weight down. The headband and earpads are made of Alcantara, a synthetic suede that is extremely comfortable and built to last. Speaking of the ear pads, they’re user replaceable, which is good. However, they’re extremely difficult to put back on as you have to rotate the pads while trying not to unseat the bead. Luckily you can switch them out for pads found on its siblings the DT 1770 Pro and DT 1990 Pro. They’re also quite stiff out of the box and will need to be broken in. In terms of noise isolation, the earpads do a decent job of keeping some noise out but the Amiron Wireless are really meant to be worn around the office and at home. For controls, Beyerdynamic decided to go with a large touchpad on the right earcup. We usually dread using touch controls as they never work 100% of the time but the Amiron Wireless proves it’s possible to create excellent touch controls for headphones: The large trackpad prevents mistaken gestures thanks to the increases surface area for you to swipe. Taps registered every time, unlike our struggles with headphones like the B&O Beoplay H9. The right ear cup also houses the USB-C charging port, power button, 3.5mm headphone jack and mic. When first listening to the Beyerdynamic Amiron Wireless, we weren’t blown away by any one aspect of its sound. It’s only after several weeks of listening and switching between other wireless headphones that we appreciated the levels of detail, wide soundstage, and dynamics of the Amiron Wireless. No, these aren’t headphones that wow you with big bass or sparkling highs - they just sound so clear that it’s like going from a 1080p TV to a 4K one. Bass extends low and has decent impact, though it won’t satisfy those who feeling a visceral impact of bass. Then again, these are audiophile cans that aim to show listeners exactly what’s on the track, rather than exaggerate any one part. Mids are effortless and do a good job of highlighting vocals and acoustic instruments like the guitar and cello while highs have great detail, extension, and energy. The headphones never sound too bright or fatiguing, even after hours of listening. More impressively, the Beyerdynamic Amiron Wireless sounded exactly the same whether wired or wireless. We can’t say the same for some headphones that rely on digital signal processing, or DSP for short, to sound good, leaving listeners disappointed when the battery runs out or when sitting at home hooked up to a proper amplifier. When wired, you’ll want a decent amp to drive them though they are quiet acceptable straight out of the smartphone in a pinch. Beyerdynamic’s mobile app also performs a listening test to tailor sound to your hearing abilities and you can adjust how much of an impact the custom EQ is present from 20, 40, 60, 80 and 100%. Annoyingly, you can’t disable it entirely, however. The app also lets you see your battery life, update the firmware, adjust the touch sensitivity and gain some insight about your listening habits. In terms of codec support, the Amiron Wireless supports AAC, SBC, aptX, aptX HD, and aptX LL. aptX HD supports up to 48kHz / 24bit LPCM audio data, providing higher than CD quality sound if you have the source material. We loaded up Radiohead’s A Moon Shaped Pool in 48/24 on our OnePlus 5T (which supports aptX HD) and the Amiron Wireless sounded excellent with a black background and no stuttering whatsoever. We could hear the quiet voices whispering in the background on the track “Daydreaming” without a problem. However, you’ll definitely want to go wired if you’re listening to source material that’s higher resolution than 48/24. Battery life is rated for 30 hours of listening and we saw around 25 hours listening at around 50-75% volume - which is well above the competition. Not only do these headphones last a long time, but they charge up relatively quickly thanks to USB-C, too. The Beyerdynamic Amiron Wireless are the best-sounding wireless headphones we’ve ever heard. But with great sound there are compromises like its bulky design and average noise isolation, making it less than ideal for travel. They’re also very expensive at $700 (£699, AU$999), but that price isn’t too crazy when you consider the DT 1770 Pro cost $600 (£430, about AU$800). In sonic abilities, the Amiron Wireless are in a class of their own. The V-Moda Crossfade Wireless 2 and Sony WH-1000XM2 sound great (and the Sony offers ANC) but can’t match the Amiron Wireless in terms of pure sonic performance. If you must have the best sound in a wireless package, the Amiron Wireless is it.